Do you look in the mirror and love or hate what you see? I know what it’s like to look in the mirror and ‘hate myself’. In my twenties I was very attractive and slim, and yet when I looked in the mirror all I saw was ugly and fat. At the time I thought what I was looking at was real. And then in my 40’s I saw photos of myself in my 20’s and was stunned at how ridiculous this was. I was SO attractive and slim, and yet I really thought I was fat. Such is the power of the psyche to project our inner self onto an outer screen (mirror). If you’ve watched the film ‘Shallow Hal’ it sort of covers this phenomenon. I also know first-hand what it’s like to struggle with weight. I was 13 years old when I first felt ‘fat’ and spent the next 25 years trying one diet after another. My weight would go up and down, up and down, up and down. Counting calories, starving myself, Atkins diet, detox diets, you name it, I probably tried it… sound familiar? 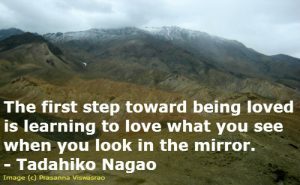 This is what happens to people who experience severe eating disorders such as bulimia and anorexia – what they see in the mirror are just outward manifestations of a hidden inner habit of self-loathing and self-rejection, which come as the result of feeling unloved, not good enough, rejected etc in childhood, which we then turn inwards on ourselves and REJECT OURSELVES. Then about 20 years ago I read a book called ‘The only diet there is… is love’ by Sondra Ray. She explained the reason we can’t lose weight is because WE DON’T LOVE OURSELVES ENOUGH and that the weight is there for emotional protection. 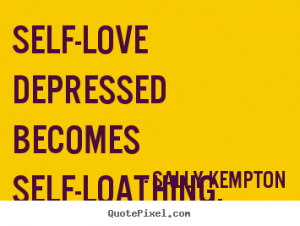 I tried to do the self help self-love exercises in the book but I just wasn’t able to do them properly because at a deep fundamental level I really didn’t like myself. I needed help but didn’t know who to turn to so I just gave up on trying to ‘love myself slim’ and gave the book away! Part of me didn’t even believe it was true, that I could love myself slim. Then a few years ago I came across Marianne Williamson’s book ‘A Course in Weight Loss’ where she explains the reason we hold those extra pounds is because we don’t love ourselves enough, and even more than that, because we are DISCONNECTED FROM OUR OWN DIVINITY. And finally I was ready to hear this information. I have to admit I am still a work in progress on this journey of loving myself unconditionally, because in childhood I unconsciously set up such deep feelings of self-loathing and self-disgust, which mostly I was consciously unaware of. What I have discovered along the way is that if we don’t receive enough UNCONDITIONAL LOVE, respect, cherishing, valuing, acknowledgement etc from our primary caregivers, and in fact experience the opposite, such as cruelty, hatred, meanness, anger, punishment, betrayal…. we grow up feeling ‘something is wrong with me’. In psychology terms they say that our fundamental ‘human needs’ or ‘human givens’ are not met. As a child we can never make our parents or caregivers ‘wrong’ because if we did we literally fear we may be abandoned and die, so we MAKE OURSELVES WRONG instead. As a consequence of this we create what are called ‘unconscious limiting beliefs’ such as ‘I’m not good enough”, “I don’t deserve” (happiness, abundance, success) “I’m of no value” etc. Deep down we feel worthless, and for some it even feels like WE DON’T DESERVE TO BE ALIVE. We live our life split, one part of us wanting to live, the other unconsciously wanting to die. It’s like driving in the car with one foot on the accelerator and the other on the brake. We get no-where and it’s exhausting. Can you relate? For our inner self it’s excruciatingly painful to never feel good enough, feel unworthy, feel alone, unsupported… It’s tantamount to Soul suicide. We go through life feeling separate, never good enough, sabotaging success, experiencing unhappy relationships, struggling with money and more. It’s not fun. Can you relate? The solution is to learn how to love ourselves deeply without conditions. This IS the very definition of unconditional love – love without conditions. We have to learn to love ourselves, accept ourselves, cherish and nurture ourselves, value ourselves, because if we never got it from our parents, especially our mother, we have to give it to ourself as an adult, and this is not easy at first. 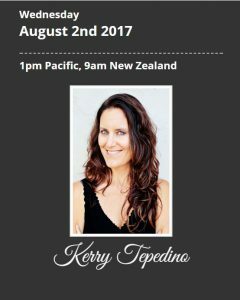 This week I will be introducing self-love coach Kerry Tepedino on her SELF LOVE WEIGHTLOSS webinar. Kerry and I have a mutual connection through our discovery of the ultimate mother – AMMA the Divine Mother. Amma is known as the ‘hugging saint’ – she is an extraordinary woman who has given ‘spiritual hugs’ to over 34 million people around the world! Can you imagine? When you receive a hug from Amma you are being blessed with the energy of the Divine Mother energy of the Universe. It is an extraordinary experience which cannot be put into words. I highly recommend visiting Amma if she comes to a place near you. I am happy to say that finally, after 50 years of searching, I am finally starting to love myself. It’s been a long, LONG journey of many hills and valleys, but it is worth it. 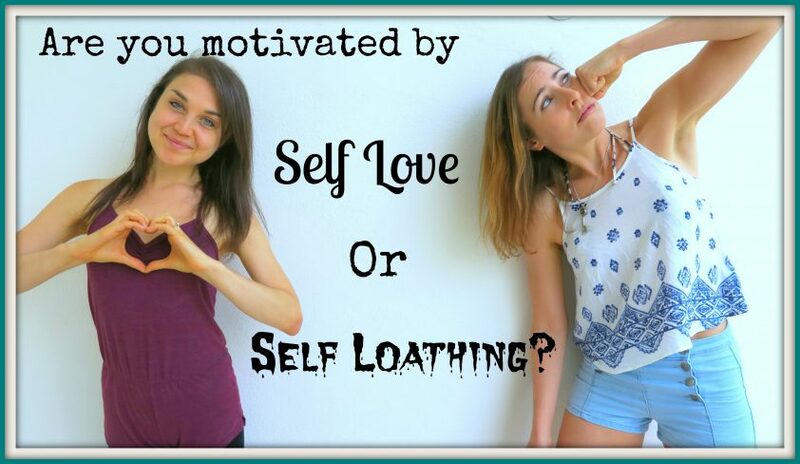 If you want to know how to love yourself more and also want to know how to melt those extra pounds off with love, you might want to check out Kerry’s webinar this week. I will be there introducing her and I’m looking forward to seeing what I can learn myself.